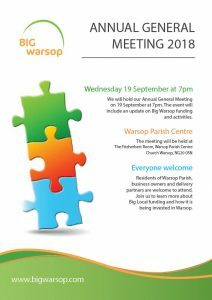 Big Warsop will hold its Annual General Meeting on Wednesday 19 September at 7pm in the Fitzherbert Room at Warsop Parish Centre. The event will include an update on Big Warsop funding and activities and is an opportunity to find out more about Big Warsop and how Big Local money is being invested in the Warsop Parish. Local residents, business owners and delivery partners are all welcome to attend the event. We hope you can join us.